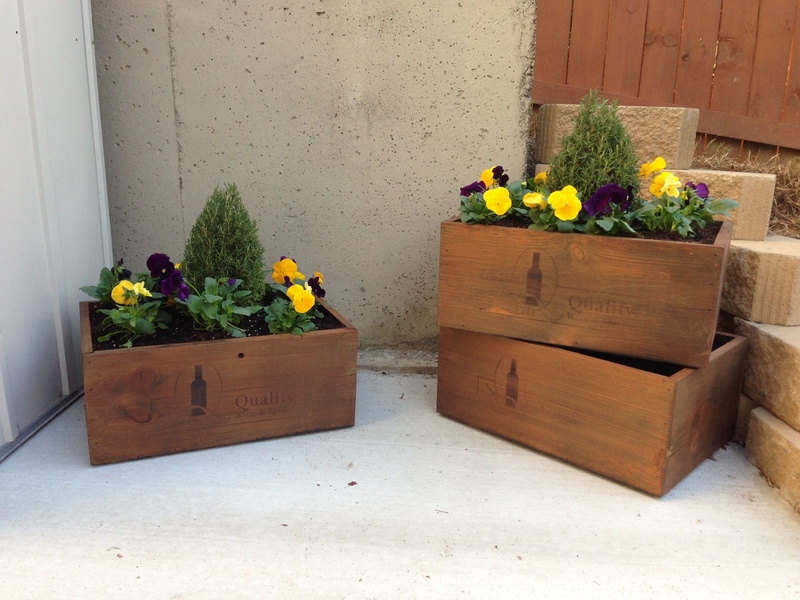 The Patio Project Chronicles continue with minor updates on our first 2 projects — the hanging pallet bed and the wine crate planters. 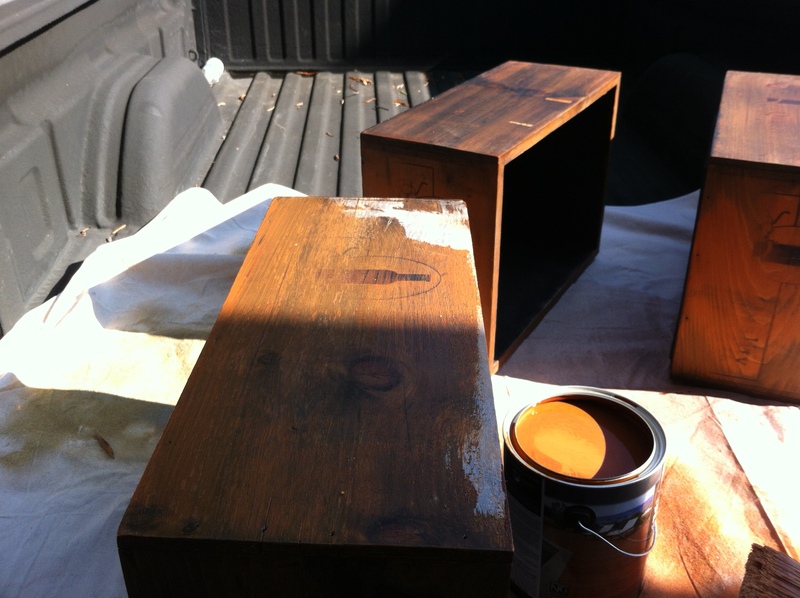 Craig finally had time to stain the planters and coat the insides and bottoms of them with a sealant to keep water from running out everywhere when the plants are watered. I think they look so great — especially considering they were in a trash pile at our neighbor’s house before Craig rescued them! And we got plants! I wanted mums for the fall/winter, but Craig was told at the garden store that we missed the window for those. So after a little pouting, we I moved on. The plants that look like mini Christmas trees (how appropriate for the season!) are actually rosemary plants. I really like the way they look when paired with the pansies. They’re festive and a little unexpected. I just hope the bunnies that terrorize our neighborhood plants don’t sniff out the rosemary and eat it all! 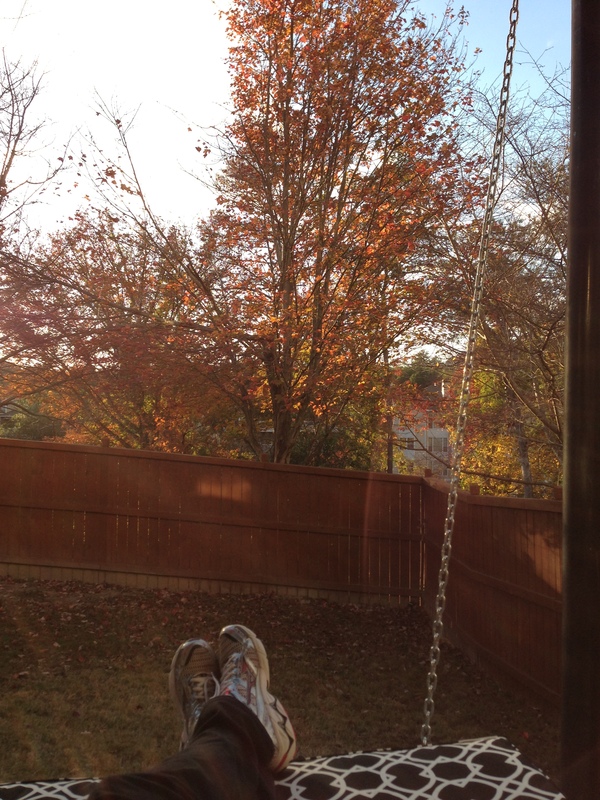 Moving on to my favorite part of the patio — the hanging bed! We’d been brainstorming on how we could easily and cheaply create some sort of cushion for the bed… but we don’t own a sewing machine, and I don’t know the first thing about making something like that. I remembered that my favorite bloggers, Young House Love, had posted about some cute seat cushions they’d gotten recently for their new deck. I searched their blog archives for that post and found that they’d gotten them at Garden Ridge. I have never been to a Garden Ridge, so I looked them up and found one just north of Atlanta. They have like 100 different options for outdoor cushions, but most of them resemble something you’d see on your grandma’s patio if she lived in Miami in the 80s. Luckily, we happened upon this modern pattern in black and white, and I’m in love!! We hadn’t thought to measure the bed before heading out on our cushion search (we were already out running errands), so we just guesstimated and got 4 cushions to cover the width of the bed. Turns out, they work perfectly! 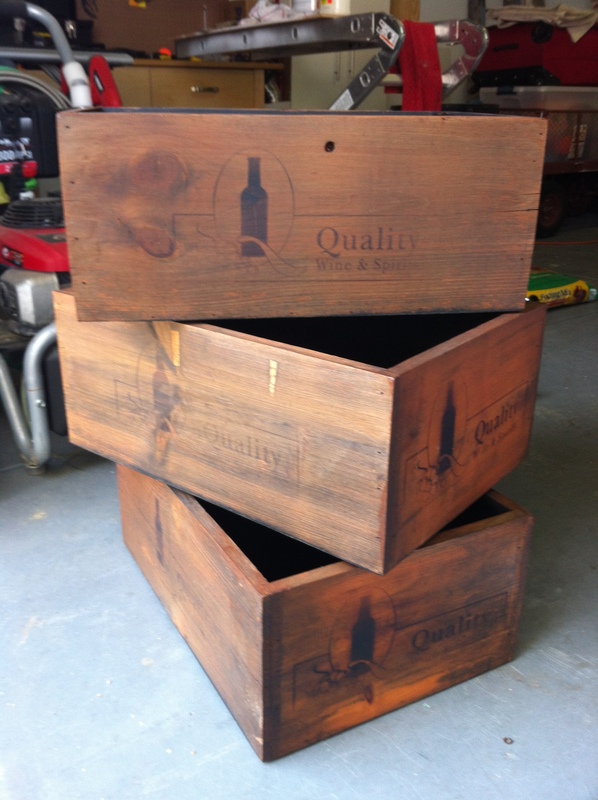 They’re outdoor material, but we plan to only put them out when it’s being used so as to preserve the fabric longer. 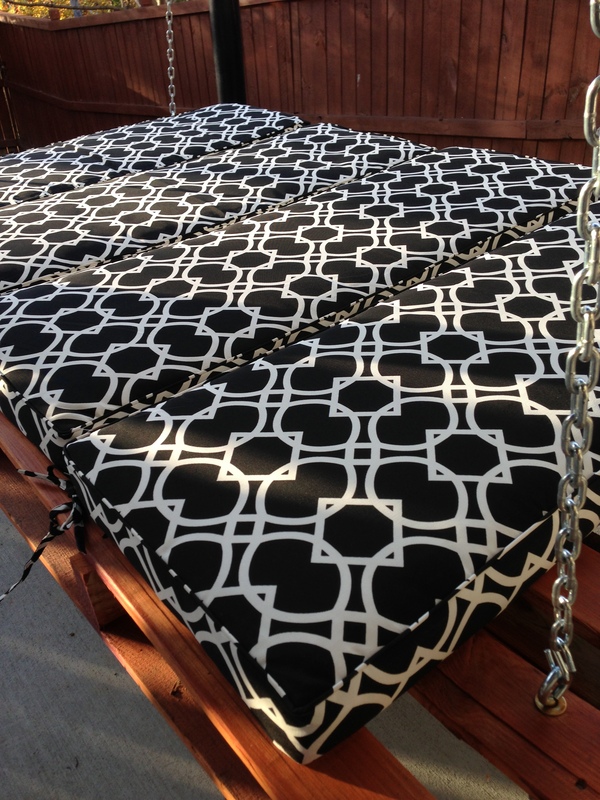 When we’re ready to use it, we just have to tie each cushion to the slats in the bed so that they’re nice and secure. 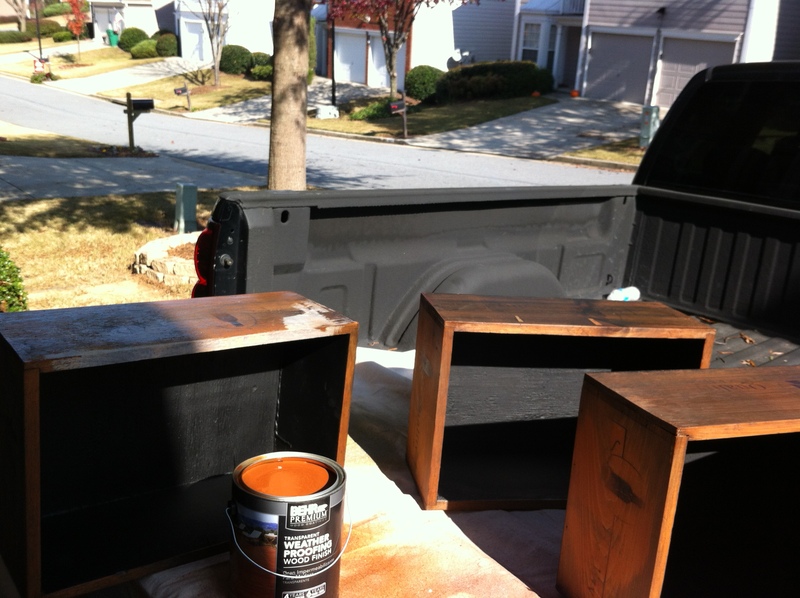 Craig also stained the bed to match the fence and planters. 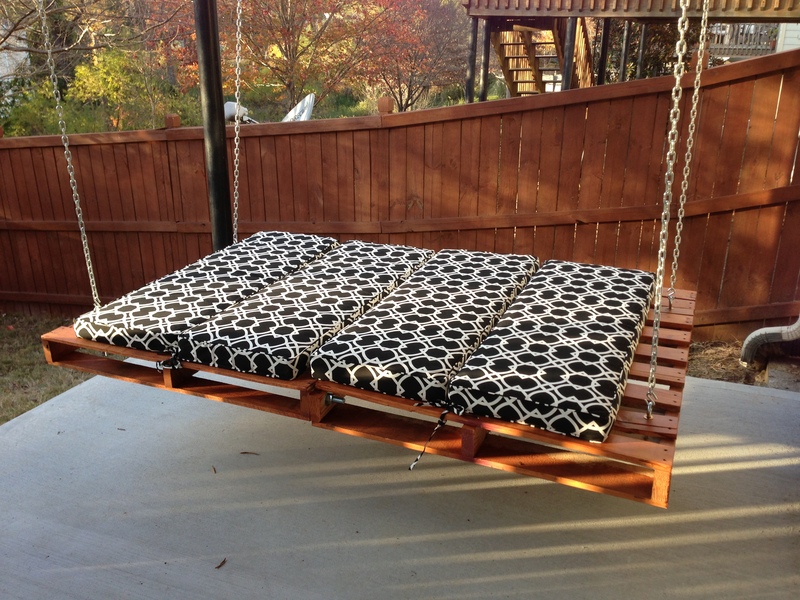 Perfect for lazy afternoon reading and napping!